Growth Hormone Key to Corneal Wound Healing? Human growth hormone (HGH) activates epithelial cell movement in vivo, reports a new study published in the June 2015 Cornea. These findings could lead to topical compounds that promote more efficient corneal wound healing in patients with persistent corneal epithelial defects (PCEDs) by activating corneal epithelial cell proliferation and migration. Researchers from Harvard Medical School and the University of Utah evaluated the effects of HGH cell signaling, proliferation and migration and whether insulin-like growth factor-1 (IGF-1) may mediate these effects using immortalized human corneal epithelial cells and primary human corneal fibroblasts. Five cultures were set up: corneal epithelial cells in keratinocyte serum-free medium (KSFM) supplemented with 5ng/mL epidermal growth factor (EGF) and 50μg/mL bovine pituitary extract (BPE) for two days; two cultures of corneal fibroblasts in 10% fetal bovine serum (FBS) for two days; and two cultures of corneal epithelial cells in 10% FBS for five to seven days. After culturing, researchers observed a dose-dependent increase of p-STAT5, a protein responsible for cell signaling, in both cell types. IGF-1 did not play a differentiating role. Contact lenses loaded with lactoferrin (LF) could prevent the effects of oxidative stress on the tear fluid, reports a study in the June 2015 Cornea. Researchers from the University of Milano-Bicocca in Italy incubated three types of contact lenses—galyfilcon A, filcon V and falcon 1B—for one, three or five hours at room temperature in an apolactoferrin (iron-depleted form of lactoferrin; abbreviated as apoLF) 2mg/mL solution. Results indicated maximum loading at five hours was 61±19µg for falcon V, 39±4µg for filcon 1B and 42±14µg for galyfilcon A. After incubation, the lenses were placed in a phosphate buffer and the quantity of released apoLF was evaluated at one, two, three and 24 hours. Data showed the release of adsorbed apoLF was 49±12% for filcon V, 66±20% for filcon 1B and 100% for galyfilcon A.
Multipurpose solutions have a limiting effect on contact lens biofilm formation, reports a study in May 2015 Eye and Contact Lens. Italian researchers evaluated the antibiofilm activity of Regard (Vita Research), Biotrue (Bausch + Lomb) and Opti-Free PureMoist (Alcon) on Serratia marcescens, Pseudomonas aeruginosa, Staphylococcus epidermidis and Staphylococcus aureus. Cultures were treated with two concentrations of the solutions (75% and 100%) and monitored for 21 hours. A piggyback penetrating keratoplasty technique may be a safe alternative to conventional PKP when associated with an open-sky procedure, reports a case report in Cornea. During a combined cataract/PKP, the surgeon—noting the possibility of imminent IOL prolapse—inserted the donor corneal graft into the anterior chamber beneath the recipient cornea, creating a temporary piggybacking effect before the recipient’s cornea was removed. Acuvue has released its 1-Day Moist multifocal for presbyopia. The lens is the first on the market to match the aspheric center-near optical design to pupil size as it changes according to age and refractive power, the company says. Check out more articles from the June issue of RCCL here! GP Innovation is Alive and Well! Doctor, Why Is My Vision Blurry? As with any field, innovation and change in eye care are happening constantlyand these days it's occurring at breakneck speed. Ongoing studies, as well as plans for future research, are the cornerstone to advances in all areas of clinical care. Without novel ideas, stagnation and decline are inevitable. 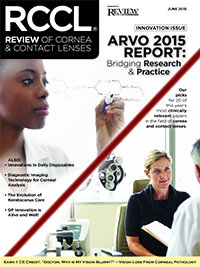 The June issue of Review of Cornea & Contact Lenses is devoted to exploring ongoing innovations in the field of cornea and contact lenses. Below are 20 pearls from the recent ARVO conference in Denver. Click through to read more here. 1. Patients with diminished iris function often experience photophobia, glare and poor vision when exposed to excessive light. For those with congenital or trauma-induced iris damage, commercial artificial irises provide aesthetic improvement but don’t address iris function; however, photo-responsive contact lenses that mimic the natural iris’ response to light could help these patients. 2. Reuse and overnight wear of daily disposable contact lenses raises the risk for bacterial infection and other contact lens complications. A study attempting to quantify predictors for reuse and overnight wear found both increased significantly in correlation with longer time since refitting. This suggests ECPs should retrain patients when refitting daily disposables regardless of patient contact lens experience. 3. Matrix metalloproteinase-9, a marker of inflammation in tears, increases during the early years of contact lens wear parallel to the onset of morphological changes in the meibomian glands, suggesting an inflammatory mechanism plays a role in meibomian gland dropout in contact lens wearers. 4. A controlled-release nanowafer drug delivery system proved equally as effective in treating dry eye as topical dexamethasone drops instilled twice daily for five days, suggesting such a system has potential for delivery of other drugs to the ocular surface in a way equal to or more effective than current methods. 5. There may be a significant link between dry eye and dry skinand since both play a significant role in dehydration prevention, a single factor may regulate internal water levels. Patients without dry eye symptoms self-reported oilier skin than those with dry eye symptoms, and sebum levels were measured to be higher in subjects without dry eye symptoms compared with those with dry eye symptoms. 6. Three new autoantibodies—secretory protein-1 (SP-1), carbonic anhydrase-6 (CA-6) and parotid secretory protein (PSP)—could make identification of Sjögren’s syndrome in dry eye patients both quicker and easier. Researchers examined 68 dry eye patients using the Sjö kit: 22 tested positive for the novel SS autoantibodies (32.4%) while four tested positive for traditional autoantibodies (5.9%). Of the three novel autoantibodies, CA-6 was the most prevalent. There was no significant correlation between ocular surface exam signs and the presence of novel autoantibodies, however. 7. Patients with recalcitrant or endstage corneal disease who receive Boston Keratoprosthesis (Boston KPro) artificial corneas often report significant glare following surgery. While this issue can be helped with an opaque contact lens, movement of the lens can limit its ability. A new titanium back plate in the Boston KPro device provides better glare protection compared with the older PMMA counterpart, with no difference between pseudophakic and aphakic KPros. 8. Patients with atopic dermatitis may have higher potential for graft rejection, infection and post-keratoplasty atopic sclerokeratitis. However, systemic immunosuppressants or corticosteroids prescribed during the preoperative period may improve graft survival; while a study observed several cases of graft rejection and methicillin-resistant Staphylococcus aureus (MRSA), no cases of post-keratoplasty atopic sclerokeratitis were observed. 9. Topical steroids can be used to treat superficial or anterior segment inflammation, but systemic treatment is necessary to treat diseases of the orbit or posterior segment; thus, optometrists must understand both the physiology of endogenous corticosteroids and the pharmacology of their synthetic analogs in order to fully use these agents in a successful anti-inflammatory regimen. 10. Topical mitomycin C (MMC), a well-established primary or adjunctive therapy for ocular surface neoplasia, is commonly linked to adverse effects such as allergic reactions, epiphora secondary to punctal stenosis and limbal stem cell deficiency. Ptosis, however, is rarely reported as a consequence (1%). In a study of 54 neoplasia patients receiving mitomycin treatment, 42% reported ptosis, suggesting in fact that MMC therapy at a standard dose and regimen is vastly underreported, and that patients should be better warned of this potential adverse event. 11. Dry eye patients with Sjögren’s syndrome treated with lid-debridement scaling (LBS) showed statistically significant improvements in OSDI along with ocular staining and meibomian gland function, suggesting LBS may help with the management of Sjögren’s syndrome-related dry eye. 12. Skin type, eye color and hair have no statistically significant impact on the likelihood of meibomian gland dysfunction in Caucasians, according to a study evaluating the prevalence of MGD in this population. Overall prevalence of MGD in Caucasians was substantial, however (70.2%), which is significantly higher than previous reports. 13. Increased osmolarity and ocular surface inflammation may result in decreased corneal thickness in patients with blepharitis. A study from France evaluated central corneal thickness of 40 eyes of 20 patients (11 men) with blepharitis compared to 40 eyes of 20 healthy patients; mean central thickness was 527.5µm in the study group vs. 554.9µm in the control group. 14. Pan-corneal crosslinking (CXL) is used to stabilize and reduce corneal curvature in keratoconus (KC). However, theoretical finite element models (FEM) of crosslinking in the keratoconic cornea have suggested focal treatment may lead to better postoperative central corneal symmetry, and the recent development of patterned UV systems offers an opportunity to provide focal treatment with the intention of improving vision. A study examining focally applied crosslinking in keratoconus patients found focal CLX subjects’ central topographies were more symmetric at six months, exhibiting inferior flattening and superior steepening on sagittal and tangential maps as predicted by FEM models. 15. A dexamethasone formulation on the market may be especially effective against blepharitis, reports a recent study evaluating DuraSite. Patients randomized to the dexamethasone-azithromycin arm and dexamethasone arm alone experienced a statistically significant greater reduction in blepharitis scores when compared with the AzaSite and/or vehicle alone groups. Few side effects were noted. These results suggest the anti-inflammatory properties of dexamethasone formulated in the long lasting DuraSite vehicle appear to be effective in treating signs and symptoms of blepharitis for up to six months. 16. Researchers investigated whether a single 12-minute thermal pulsation treatment using the LipiFlow (TearScience) device improves subjective and objective variables relating to dry eye and MGD, and if a correlation to Sjögren's syndrome exists. Patients exhibited statistically significant difference between pre- and postoperative SPEED scores, TBUT and MGES, suggesting the effectiveness of a single treatment using LipiFlow. Additionally, 43% of the patients tested positive with the Sjö test compared with 26% of the controls, indicating there is a strong correlation between a positive Sjö test and MGD. This suggests there is an autoimmune component contributing to symptoms experienced in this disease process. 17. An alternative method of whitening the eyes using subconjunctival injections to avoid complications associated with current, controversial techniques involves ink being injected into the subconjunctival space using a 25-gauge needle. Researchers noted the ink covered deeper scleral vessels but that superficial conjunctival vessels were still visible, suggesting the technique may be a viable, safer means of whitening the eyes compared with other eye whitening procedures that combine the removal of generous portions of the conjunctiva with cautery, laser and use of antimetabolites. 18. Elevated levels of certain tear film components may at least partially mediate the discomfort response during lens wear, according to a study that measured prostaglandins, leukotriene B4 and cysteinyl leukptriene (C4, D4 and E4) using enzyme immunoassay kits in both symptomatic and asymptomatic contact lens wearers. An elevated LTB4 level was detected in symptomatic wearers compared with asymptomatic wearers, but the other markers remained essentially unchanged across the two comfort groups. Lysozyme levels were slightly reduced in symptomatic wearers at the end of the day. 19. A study evaluating oxygen transmissibility of scleral lens systems demonstrated that an increased thickness in clearance reduces oxygen tension available to the cornea. Researchers measured the thickness of the liquid layer beneath the contact lens using optical coherence tomography and pO2 levels at the corneal surface using a Clark electrode and an electrometer linked to a computer after five minutes of wear. Ideally, a clearance close to the 200µm level may help the adequate amount of oxygen reach the cornea. 20. A non-contact in-vivo mechanical mapping of keratoconus based on Brillouin scattering with axial scans at various lateral positions could be used to assess corneal ectasia. The balance between the cornea’s mechanical strength and intraocular pressure is critical to maintaining normal shape—when this is disrupted, the stress can lead to progressive compensatory thinning and bulging of the cornea, or keratoectasia. In normal patients, it was observed that corneal mechanical strength decreased with depth and increased toward the periphery. Additionally, the modulus also increases with age. Thus, the Brillouin modulus was positively correlated with corneal thickness and negatively with front surface sagittal curvature.